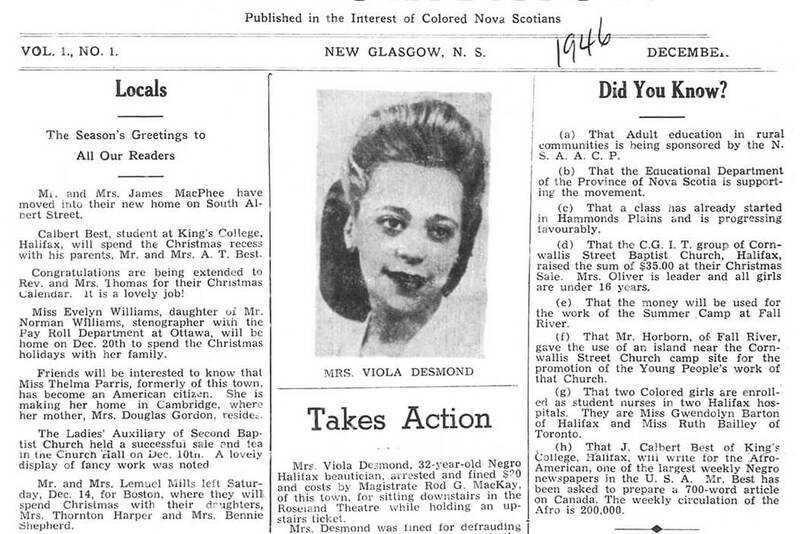 On November 8, 1946, Viola Desmond was on a business trip to New Glasgow, Nova Scotia, where she planned to sell beauty supplies. Her car broke down, and she couldn’t get it fixed until the next day. To kill time, she decided to go to a movie theatre. After buying a ticket and heading to the main seating area, a staff member told her she had purchased a ticket for the balcony. Even though she offered to pay the difference, Desmond was told, “We can’t sell those tickets to you people.” She refused to leave her seat, and was sent to jail—the police officer who dragged her injured Desmond’s hip and knee in the process. The next day, Desmond appeared in court, where she wasn’t informed of her right to have a lawyer, and was charged with tax evasion (the judge claimed she didn’t pay the extra cent in tax required for a main stage seat). Desmond found a lawyer, who brought the case to Nova Scotia’s Supreme Court. Desmond lost. It wasn’t until 2010, nearly forty-five years after Desmond died, that the Lieutenant Governor of Nova Scotia pardoned her. Desmond’s addition to Canada’s new $10 bill, replacing Sir John A. Macdonald, is cause for celebration. Representation matters, and $10 will become priceless in some hands. The new currency can serve as a catalyst, generating conversations about Canada’s racist policies throughout history. But Desmond is not the first or only black civil rights activist in Canadian history. Many others deserve, and need, to become part of the Canadian conversation as well. Canadians know little about our own troubled history with slavery and racism, beyond the fact that we were the safe country at the end of the Underground Railroad. Yet according to Marcel Trudel, author of Canada’s Forgotten Slaves, more than 1,000 black people were brought to Canada as slaves by 1759. Craig Smith, the president of the black Cultural Centre for Nova Scotia, told CBC News, “Here in Canada, we’re really good at—for lack of a better term—whitewashing history, or even just omitting it from the history books altogether so nobody has to learn from it.” Smith has urged for Desmond’s story to be included in primary history courses throughout Canada—and that would be a good start. In 1936, Fred Christie was denied service at a bar in Montreal for being black. He brought a challenge to the policy all the way to the Supreme Court, who ruled that businesses have the right to choose not to serve people for any reason. The fight against segregation was far from over. In 1948, Hugh Burnett and the National Unity Association, a group fighting for racial equality, launched a campaign against segregation in Ontario businesses. In 1954, as a direct result of their actions, Ontario passed the “Fair Accommodation Practices Act.” The law stopped segregation in a formal sense, but the practice continued. Bromley Armstrong, along with other activists from the Joint Labour Committee for Human Rights, then organized sit-ins and launched lawsuits against businesses that still refused to serve black people. Even though segregation was not enshrined in Canadian law, as it was in the United States, it was still present; the last segregated school in Canada, located in Nova Scotia, only closed in 1983. Racist policies were not limited to black people already in the country. Donald Moore, who came to Canada from Barbados at thirteen, fought the country’s discriminatory immigration practices. In 1954, he led a historic delegation to Ottawa to protest the Immigration Act, which prevented black commonwealth subjects from Africa, the Caribbean, and Southeast Asia from immigrating to Canada because they allegedly “could not adjust to Canada’s rigid climate or assimilate well into the society.” In 1962, after years of tireless work, new regulations were put into place that eliminated many of the overtly racist criterions for immigration, shifting it to a supposedly merit-based process. It’s easy to portray Parks and King’s opponents solely as uneducated rednecks. It absolves us responsibility. Instead of critically examining our society, we cast the antagonists as overt caricatures who shoulder all the blame. If the Heritage Minute on Desmond, who died in 1965, serves as a trailer for what is to come, this may very well happen in Canada, too. In the inevitable made-for-TV-movie, the bad guys in her story will be reduced to theatre staff, the police officer, and a few judges. Desmond’s lawyer will become the white saviour. Her loss in court will mark the defeat inevitably waiting in act two. Fast-forward and we’ll see Desmond’s sister using the new $10 bill to watch a movie—Desmond’s movie. Everyone is happy, the end. The reality is that racism in Canada isn’t limited to a few bigots. It lives in institutions and communities; it is the foundation they were built on. This is difficult to admit for many Canadians, even those with good intentions, as it cuts out any moral escape routes: racism is the rule, not the exception. Christie, Burnett, Armstrong, Moore, and Desmond, among others, were all fighting the same enemy, despite living in different times, at various places in Canada. It’s crucial that their stories be perceived as a series of interconnected events, not a collection of separate moments. Canadians must also resist the urge to discuss these important battles solely as historical incidents, existing in a different era. Instead, they are just earlier scenes in a long-running horror unfolding around us, haunting some while others deny it’s real. Carding, a practice whereby police can stop, question, and document people, for any reason, has disproportionately targeted black people. The Toronto Star’s Known to Police 2013 series found that black people make up approximately 8 percent of the city’s population, but over 27 percent of carding incidents. In July 2016, Ottawa police beat Abdirahman Abdi, a thirty-seven-year-old black man with mental health issues, with batons and fists until he lay unconscious on the street. They handcuffed him, and left him without medical care for at least ten minutes. He was pronounced dead the next day. Officers said he was a threat. He was holding a piece of construction foam when he died. In recent years, other black men have met similar fates. Despite the ostensible progress in combating discrimination, these events, among others, have perpetuated the feeling that black people don’t belong in certain places. A black woman on our currency isn’t white smoke, telling the world Canadians have chosen an egalitarian future. The linear conception of progress doesn’t exist, as racism doesn’t just steadily disappear, but rather morphs and adapts to prevailing norms. The new $10 bills will be stuffed into a donation box at a Kellie Leitch rally, where she’ll call for immigrants to be screened for Canadian values. Discrimination isn’t limited to history books; it’s ongoing. Civil rights activists aren’t a relic of the past; we see them on the news every day, and they are often loathed. The Black Lives Matter coalition is smeared as a terrorist organization made up of “reverse racists” taking things too far. As such, Desmond’s presence on the $10 bill doesn’t mean the fight against racism is a done deal; it’s just an important marker in the struggle for change. Canadians need to treat it that way.